Roy brings his skill as a fine concertina player and singer. He can move effortlessly from a traditional ballad to shanty to music hall ditty. 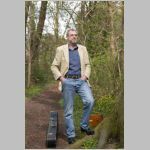 His programme is peppered with songs from his beloved Cheshire and his self-penned songs sit comfortably alongside the genre. In the second half of the evening Roy will be joined by his wife Mary and Rose Price to bring you items from "When this old hat was new" a presentation of nineteenth century life in song.